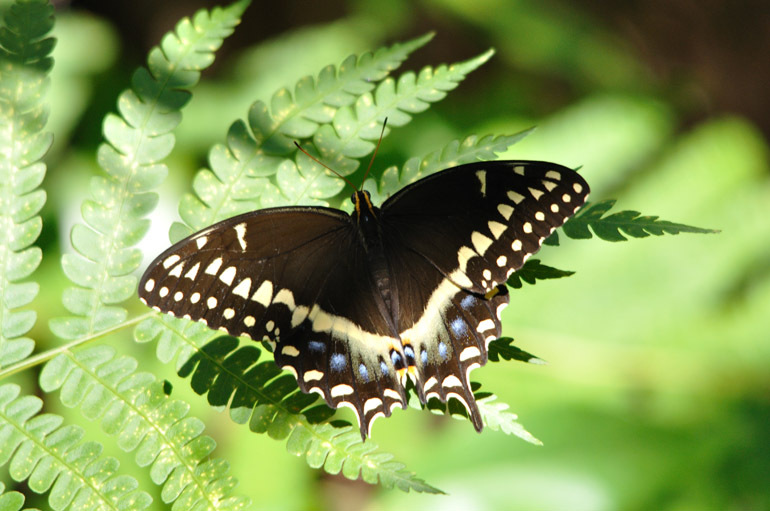 A palamedes swallowtail spreads its wings on top of a fern deep in Melbourne's Wickham Park. Note: Yes, I was drugged when I wrote the original headline for this post. I left out the "get." Demerol, prescribed after a recent surgery, makes me stupid. I was taking a Saturday afternoon stroll in Wickham Park, hauling along my new camera equipment, of course. There were turkey vultures and a few osprey, but it appeared that the park, which is about a mile from my apartment in Melbourne, was more of a barren habitat than the Viera wetlands and the Palm Bay sanctuary that I had visited in previous days. None of the photos I took were worthy of The Offlede. But as I walked along the fern-lined trail that cuts through dry palmettos, I spotted a butterfly slowly opening and closing its wings. It was perched in a patch of sunlight. My new Sigma 150-500mm lens didn't send me home empty.